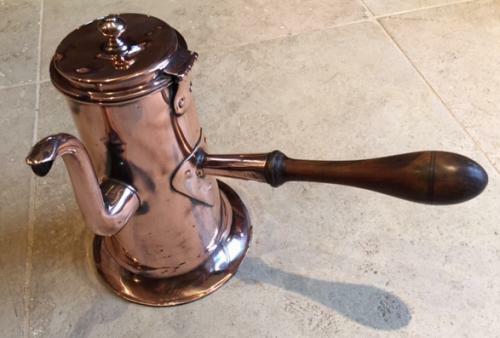 Fine 18th Cent English Copper Chocolate Pot as used in the coffee houses of the 1700's. Chocolate became a popular drink at that time and was served hot as a drink and served from these pourers. This one is in lovely condition in that it is virtually dent free, has quality heart shaped fitting, quality hinge to the lid which still opens and closes well. Wide flared base and fruitwood or Yew wood handle. The spout has a slight crease but overall the item has fared well for being over 200 years old.